This guide shows what to do when an employee cannot work their shift. When someone calls in sick, or is absent, or simply doesn't turn up it can be quite painful finding a replacement. You have to pick up the phone and call one person at a time to see who can work the shift. Often managers will just let that position go unfulfilled (causing customer service to suffer) or they try to fill it in on their own (causing their existing workload to slip). We take out the painful phone calls and frantic messaging and let you find a replacement for the absence with a few simple clicks. Please note, to use this you'll need to be a Supervisor, Location Manager, or System Administrator. To find a replacement via the scheduling page, click on the shift, click Shift Actions, then click 'Find a Replacement'. From here, you can select the employees you would like to inform about replacing the shift. For a step-by-step guide, refer to the GIF below. 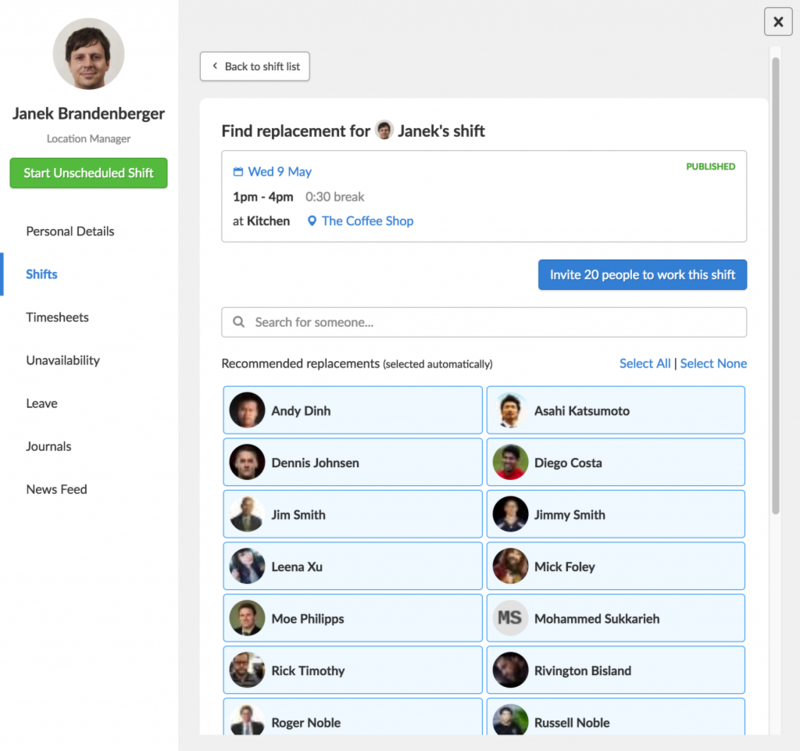 Alternatively, you can find a replacement by clicking on the employee's shift in the Team, which appears on the News Feed, Tasks, Locations and People page. First, please click the employee on the team tab. Doing so will bring up their profile. Click on the 'Shifts' tab as highlighted below. 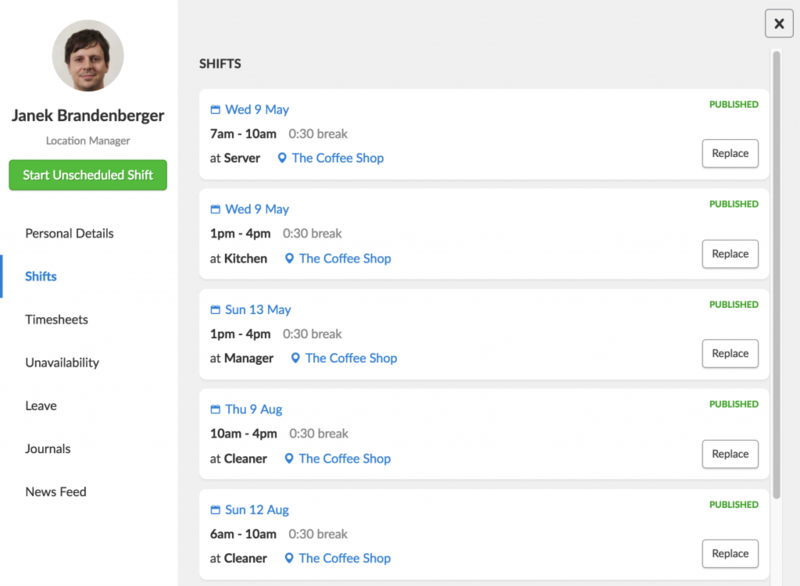 Now click 'Replace' on any shift you would like to replace. We will automatically select those who are recommended for this shift. You can manually select non-recommended people. Next please click "Invite X People". Deputy will now email all the people invited to this shift. In the email, they have information about the shift and a link to accept. If they click on the link, the shift will be allocated to them. We offer this on a first come first served basis. Whoever clicks on the email first will receive the shift. Deputy will also notify the original employee that they are no longer required to come to work. The manager will also be notified that a shift change has happened. 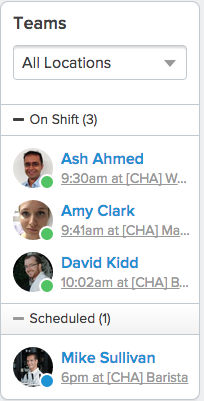 If your staff member does not have email (or the shift is for the current day), they will be sent an SMS. In this message they will have a unique shift number. They can reply to the SMS with the shift number to accept that shift. Once again, whoever replies to the SMS or clicks on the email link first will win the shift. Please note, Deputy will only SMS if an email address was not present for the chosen employee. SMS certainly costs money ($0.05) but the saving it brings as opposed to picking up the phone and dialling 15 times is already a big one! Still, if you want to save money, make sure you have your staff's email address in Deputy. Email of course is completely free of charge. 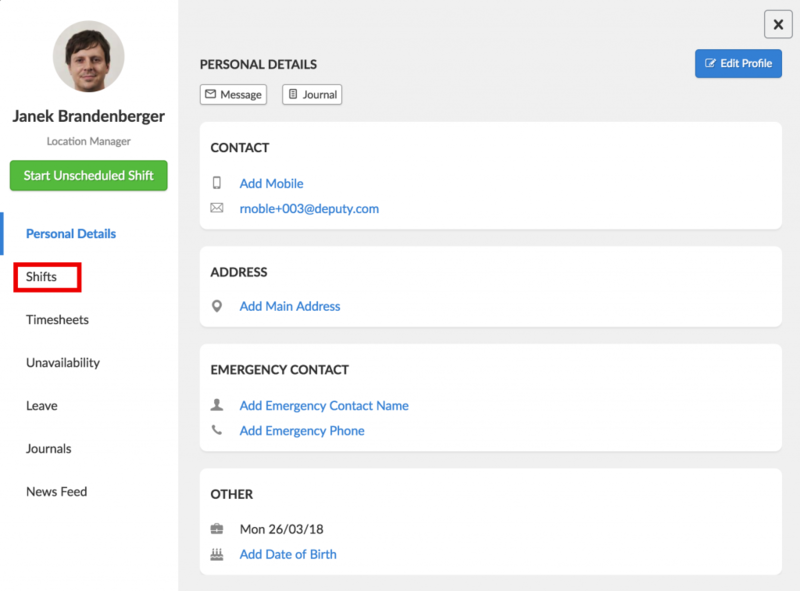 If your staff member does not have email OR a mobile number registered with Deputy, we have no way of communicating to them. These people will not be recommended or communicated to about this shift.